This summer I took a trip to Chicago for my favorite kind of vacation the quick with a full schedule. It was a 36 hour trip to tour Wrigley Field and see my first Cubs game at home. While I do have a 6x8 album to tell baseball stories. I knew this trip would need its own mini album. So when Ali Edwards released her Travel Collection and I picked up a lot of it to put in my Europe album (still a WIP) The navy 3x8 album seemed like the perfect idea to try something new. After my trip, I started with the photo editing process and I narrowed it down to under 100 photos. I sketched out an album plan. I knew I wanted to tell the trip in a chronological fashion and I didn't want to use the same pocket configuration next to each other. So I used that edit my photos to size. And when doing so I played with some settings on my Epson PM-400 I could print 3x8 on it. So I spent an afternoon printing all the photos for the album. The next step was to get my journaling done. I did my writing about the tour I took on Thursday and the game on the 3x8 pages that came in the Travel kit. I used a lot of the navy word chipboard that was in the chipboard bundle to label pieces of the day. 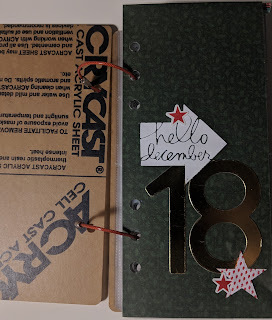 I also used a lot of word stickers to embellish the pages. From the start of the project, I wasn't sure how I would feel about the 3x8 as it felt really small when it was empty. When I finished this album I fell in love with the size. I'm actually going to do December Daily in 3x8 this year. I've included both a slideshow version and youtube video to see the flip through of my album. 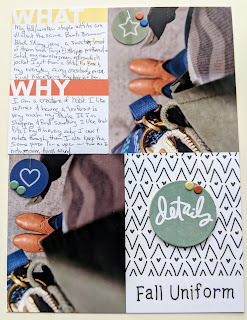 Today I'm sharing a layout I made using the Details story kit from August. I started this layout with the idea of using one of the divided pages that has 2 3x4 and 1 4x6, but I struggled as that photo on top is my 4x6 and I didn't like how it looked on the bottom so this is a full page all glued to a piece of cardstock. I have a uniform so to speak when getting dressed. I reach for the same dozen items in my closet all the time. typically it's skinny jeans, boots, a striped sweater, and a jacket. I rarely change purses so I always grab the same one. This has been my fall wardrobe for 3-8 years. So it was a story I wanted to tell. So I took these photos in my apartment garage and then printed them on my Epson Picturemate on the same day. YAY for home printing! The 3x4 title card is from an Elle's Studio grab bag I think. I used Lawn Fawn alphabets stamps. 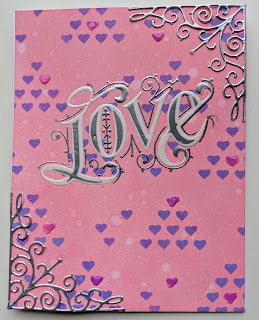 I started the card using a Hero Arts hearts stencil and distress oxides. I used the kit stamp and did a double heat emboss of the solid love in white and then white pearl to give it a nice shine. 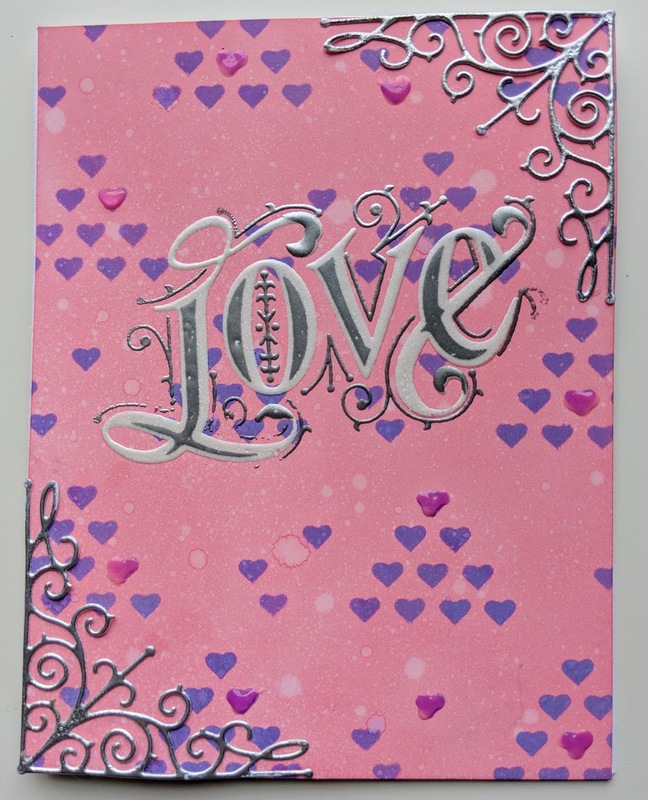 I embossed the layer stamp and the 2 corner pieces in silver I used the corner die with white cardstock and then pressed it onto my versamark pad to heat emboss the silver. I finished off the card with some morning dew Nuvo drops. Nuvo drops react with distress oxides and changes colors; so I'd suggest testing the Nuvo color you plan to use with an oxide before committing to it, or being okay with a surprise. TGIF! I'm starting a new themed album this year about baseball and all the stories that I've wanted to tell. 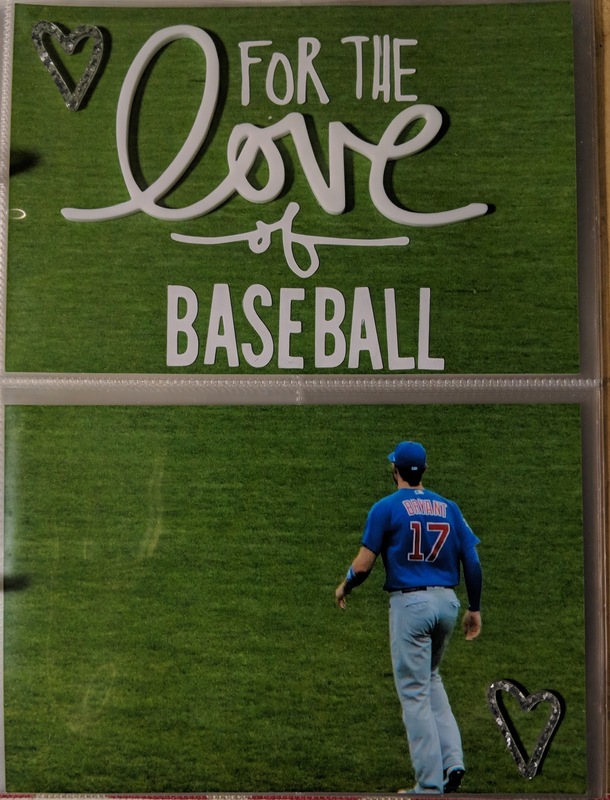 The inspiration for the album came from AE Story Kits for "Give" and "For The Love"and song by Logan Mize called Somebody to Thank at first I was just going to a layout using this picture and typing a list of all the players, managers, sportscasters, teams, seasons, and so on that have inspired my love of the sport. I wrote the list out and it was long, and I didn't love the Give kit and couldn't make anything work. Then the "For the Love" kit arrived and I was going to do the layout with this kit and I still couldn't figure it out and I realized some of these great names needed their own page. So I ordered an album and decided each story deserved its own page. These moments, people, and games meant so much to me. They've shaped who I am. So that is how this page came to be. I used the Love acyclic word as the main piece I worked with for the title. 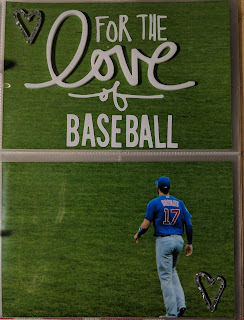 Since I get both the kit and stamp I also get the digital kit for free and used "For the love of ___" stamp file to create a cut file on my Silhouette and used a font I had on my computer to cut Baseball. I added a couple of the silver hearts from the kit. The biggest item I put on my Christmas list was a photo printer. 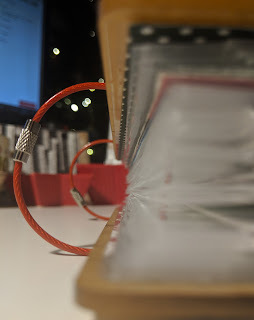 For my birthday I got the HP Sprocket and I enjoy it, but 2x3 image size can be rather limiting. 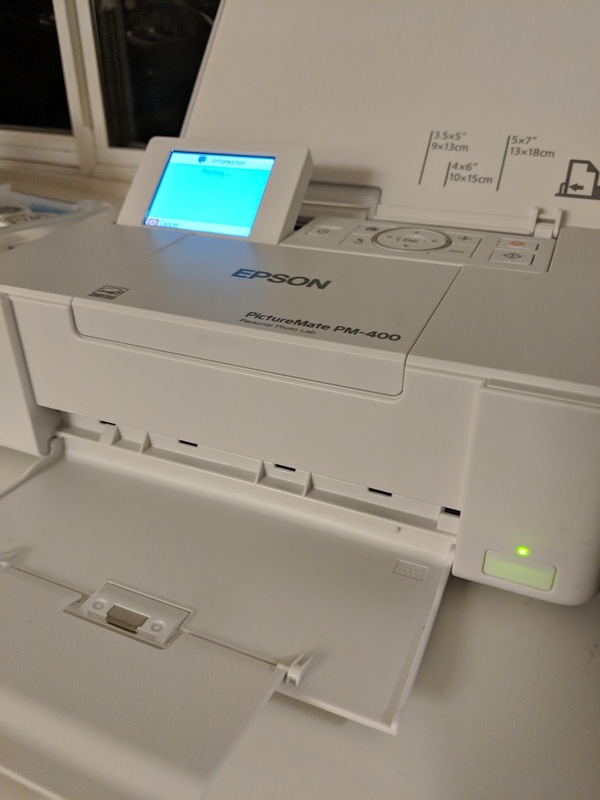 My home printer is old and while it still works well it doesn't print photos well anymore. So I did some research and put a full-size printer and this Epson Picturemate on my list. My family gave me a gift card to help cover the cost of whichever I chose. So I spent a couple weeks weighing the pros and cons with my husband before deciding on the photo printer. Amazon delivered my printer Saturday morning and I put it straight to work after about 45 minutes of setup time. My first impressions were WOW the images were vibrant and crisp and the weight of the Epson premium paper was great. 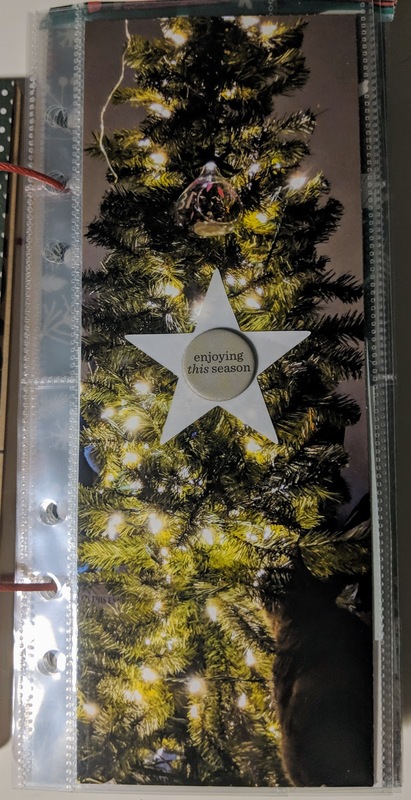 I printed a couple pictures to play with and then I printed all the photos for my December project life album. I was excited and impressed. The indifferent: I estimated that it's about 30 cents a print. Which is the same that Target charges and these photos are better than Target. It doesn't print 6x8. I knew that going in, but it's the only thing this printer is missing for me. So the TL;DR: It's a great photo printer and does a lot really well, but it is a hefty startup price tag. If you're someone who just prints a handful of photos at a time this is a great option. If you send out 100s of photos at a time then this probably isn't for you. 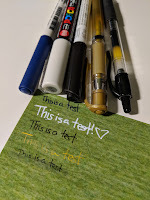 I also did a test of some of the writing pens I normally use and they all performed well on the Epson paper. I did allow the Zig glitter pen and signo pen a minute to dry before trying to smudge them which I couldn't. Even my ballpoint pen did amazing so really happy about that.